League leaders Manchester United travel to London for a crunch Premier League tie against fierce rival, Arsenal this Sunday. The Gunners have played some eye-catchy football in patches, but overall they have been very inconsistent. They haven’t been able to win three matches at a stretch this season, while losing four games already in all competitions. Furthermore, Arsene Wenger’s men are under huge pressure already to qualify for the knock out stages of the Champions League, having lost their opening two UCL games. Arsenal lost two games in a row (including 2-0 defeat against Chelsea in the league) after winning two back to back league games against Newcastle and Stoke City. They bounced back strongly with two back-to-back wins against Tottenham (League Cup) and Leicester (Premier League), but again it was followed by a moral damaging 2-3 defeat at home against Olympiakos. One of the main problems Arsenal have faced so far is the lack of goals, having scored only two goals in the league so far at home. However, the Gunners will be buoyed by the return to form of Alexis Sanchez, who scored a brilliant hat-trick in the last league match against Leicester. After Arsenal’s embarrassing 3-2 defeat against Olympiakos, Wenger has reportedly slammed his players at a training ground. The Frenchman has urged his players to improve dramatically at a meeting at their London Colney training centre. Should Arsenal win on Sunday, they would move level on points with United, but a defeat will see them fall significantly off the pace in the league. And it is easier said than done. 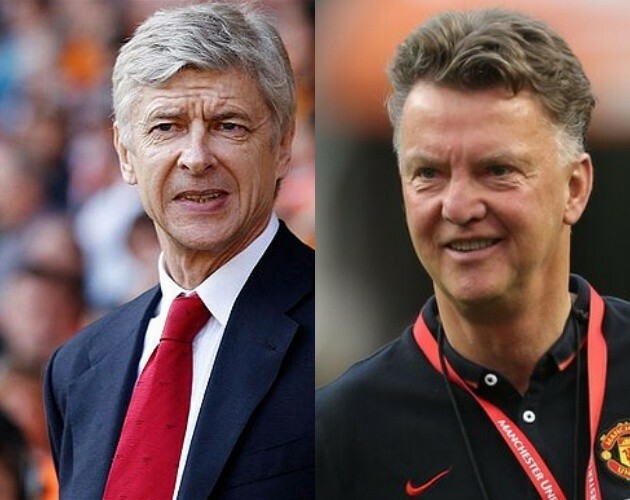 Arsenal haven’t beaten United in the league in their last eight games. Plus, they are facing a United side that are leading the table and heading into this match with full of confidence. The Red Devils have won their last four games, scoring 11 goals in the process, and are heading into this match on the back of a moral boosting 2-1 win over Wolfsburg in the Champions League. 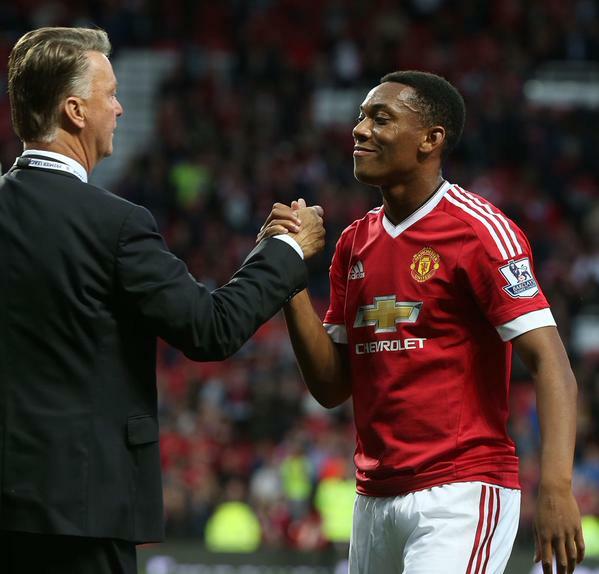 New signing Anthony Martial has made a bright impression already, scoring four goals. His signing has galvanised the entire team, and the results are evident. Juan Mata has been equally brilliant in the last few games, although Van Gaal insisted that the Spaniard can still do lot better. Against Wolfsburg, Mata’s disguised pass to Smalling has left the fans in awe and admiration. United have a tough set of fixture for the month of October, starting with the trip to Emirates. And a lot will depend on their title chances, in how they perform during this gruelling schedule over the next 28 days. After United’s away trip to Arsenal, they face an in-form Everton at the Goodison in their next league match. The Red Devils then travel to Russia to face CSKA Moscow in their next Champions League game on 21st October. The following weekend they welcome Manchester City in the Manchester Derby and the finish the month with away trip to Selhurst Park. The Gunners have a long list of injury problems. Jack Wilshere, Mikel Arteta, Tomas Rosicky and Danny Welbeck all miss out through injury. Furthermore, they will be joined by Laurent Koscielny on the sidelines. Mathieu Flamini is doubtful for the tie as well. In the midfield, Michael Carrick is set to return to training after missing their last match through injury. Bastian Schweinsteiger and Morgan Scheiderlin duo should start in the middle. Antonio Valencia was superb in the midweek in the Champions League but against Arsenal, Matteo Darmian is likely to play on the right back role. In absence of Koscielny, Paulista should come in defence alongside Mertesacker. Theo Walcott should continue as a lone forward in place of Olivier Giroud. Van Gaal needs to sort out his defence ahead of the match. Phil Jones and Chris Smalling should start, with Blind likely to play on the left back. Anthony Martial will likely to start as a lone striker supported by Depay, Rooney and Mata from behind. 3 – Manchester United have won their last three matches in the Premier League. 35 – Arsenal are undefeated in 35 of their last 38 home matches in the league.